To the Fool's eyes, it is as if the Magician has created the future with a word. All the possibilities are laid out, all the directions he can take: The cool, airy Sword of intellect and communication, the fiery Wand of passions and ambition, the overflowing Chalice of love and emotions, the solid Pentacle of work, possessions and body. With these tools, the Fool can create anything, make anything of his life. But here's the question, did the Magician create the tools, or were they already in the pack? Only the Magician knows - and on this mystery, our eloquent mage refuses to say a word. At #1, the Magician is the male power of creation by willpower and desire. The lemniscate (infinity symbol) over his head indicates the energy of thought. Thus, he draws divine power down from the heavens into his white wand, molds it with that energy of thought, and makes it manifest on Earth (his finger pointing to the ground). This is that most ancient magic to make real whatever he imagines in his head merely by saying it aloud. ("And God said 'Let there be Light!' and there was Light"). Reflecting this is the fact that the Magician is often represented by Mercury. Mercury is the planet and god of smooth talkers and salesmen. Also clever with the sleight of hand (Mercury *was* the god of thieves!) and a medicine man - either a real doctor or someone trying to sell you snake oil. 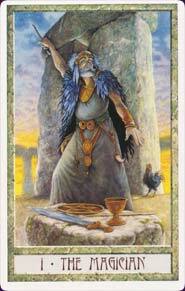 If any card in the Tarot is the Tarot, it is the Magician. He's one of the most recognizable cards, always a favorite. 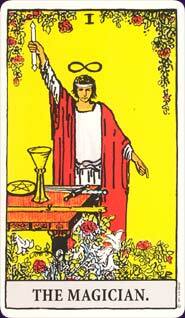 He's also the only card in the major arcana that refers to the minors with the "trumps" displayed upon his table. One way to look at them is as ideas that the Magician is offering you. Keep in mind, however, that the Magician could be a trickster. If this card represents some magnetic person in the querent's life, they need to make sure that he's or she is a genuine magician, not a con man. The card can also indicate an interest in certain careers or someone who is already in one of those careers: a scientist, inventor or medical professional. The card also relates to careers where speech and writing is of great importance: salesman, motivational speaker, storyteller, politician, commentator. This might be the querent himself, something the querent wants to be, or someone who was, is or will be in his life. Learn the Magician tarot card meaning and the rest of the card meanings, symbols and stories in our eBook.